Have you found an online vendor selling Trois Rivieres Blanc 50%? Premières impressions, au nez, il est doux et aromatique. En bouche, il est puissant mais doux, très riche. La finale est longue sans être sur l'alcool. Un rhum pour les ti-punch, planteur et autres cocktails. I have only seen Martinican cooking or baking with it! 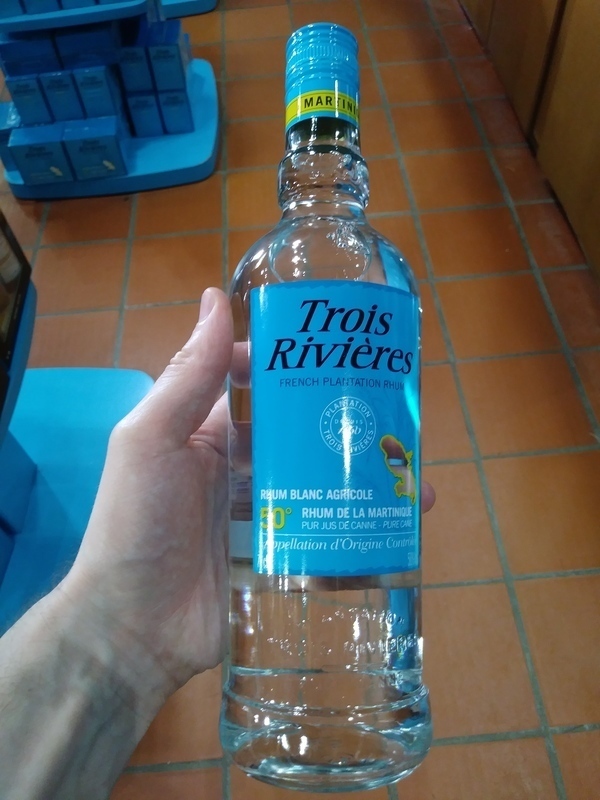 Visited the Trois Rivieres distillery while vacationing in Martinique. Distillery tours were closed for the season but full open tasting bar was offered. Blanc 50 was priced at EUR 9 per bottle at the distillery. Pretty decent bottle and label design. Traditional very dry Rhum Agricole flavors complemented with plenty of grass and floral notes to your nose and palate. Strong burn at the end. Rhum Agricole lovers can add 2 points to the score. 50% ABV. Somewhat delicate nose. A little funky/plasticy, a little briny. Hint of fruit; pineapple? Rhum floral et fruité.la version 40* pour coktail est bien.mais la version 355 est de loin la meilleure.proche du canne bleue de Clément mais meilleur.c mon meilleur blanc.le 40* note 7.1 le 355 note 8.4. Tried at Rumba in Seattle. Strange aroma but I guess I’m used to non Agricole rum. Fairly clean note. Not for sipping. 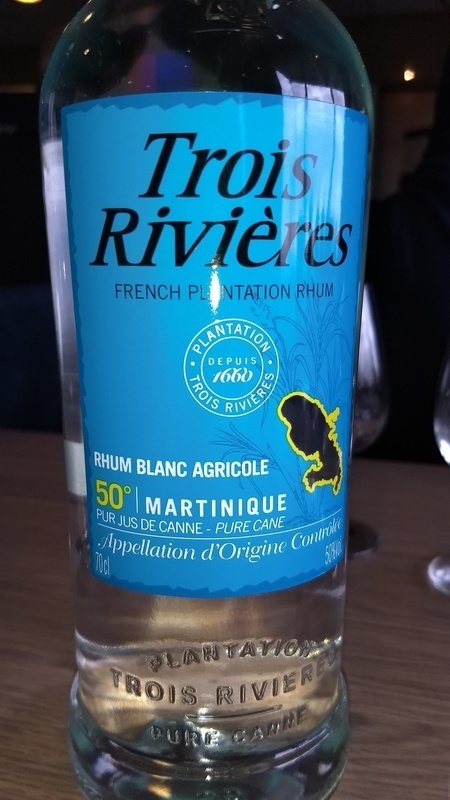 Trois Rivieres is one of favorite agricole producers. The rhums have a fresh grassy flavor at full 50% abv. Ideal for a 'ti-punch. On the palate all that with slightly harsh alcoholic taste and some acidic grassiness. Finishes quite short and dry. Not preferably for sipping but goes down ok when its chilled, but as a mixer its very good stuff. The 50% version is very decent for ti punch. Not at the level of a pere labat, but since I can't find them in my country, they do the work. Krijg dit niet door mijn strot heen. Puur vuurwater. Smaak: karamel en grassige tonen. Met een abv van 50% maar daar merk ik niets van eigenlijk. Heel zacht en blijft lang hangen. Erg lekker. Riecht schlecht, schmeckt ziemlich scharf (hat 50%), im Abgang aber besser, weicher. Etwas fruchtig, leichte Bitternote. Möglicherweise ein guter Rum, aber überhaupt nicht mein Geschmack. Rhum blanc plutôt agréable pour préparer des cocktails. Un rhum à prix élevé (pour du rhum blanc) mais autour de 15€ le litre en promotion. L'ancienne version titrait à 55°C. Ce rhum est très bon pour le Ti'punch et autre cocktail. Dégusté sec, ce rhum attaque d'abord le nez par une grosse puissance alcoolique. Le goût est très correct cependant. Consommé en planteur, punch ou rhum arrangé, il est parfaitement recommandable ! Not easy to rate. Pretty good quality rum but only for cocktails and planteurs. Not to be sipped on its own ! C'est un bon rhum à arranger; en ti punch, je ne suis pas fan!